Yep! We are back - Yahoo! We had lots of reminders in church this week, which was just a bit quieter than last week when we remembered those who died in the First World War… However, we are still remembering as the church remains full of poppy flowers and with us looking forward to hearing the Anglia Singers perform their ‘Remembrance and Renewal Concert’ next week at 3.00pm, everyone is welcome, the tickets are £8.00 each with those under 16 free… All proceeds going to the Organ fund. We were also told that the church is supporting the ‘Angel Tree Project’ this year. A local charity that gives the children of Fathers who are in Chelmsford Prison over Christmas a toy. We were asked if we could donate a toy (no more than £10.00) for children between the ages of 0-12, the toys can be brought in and left at the back of church next week or, we can donate up to £10.00 in cash, money that can be given to young people between the ages of 13-18. All donations will be collected next week on the 25th of November. 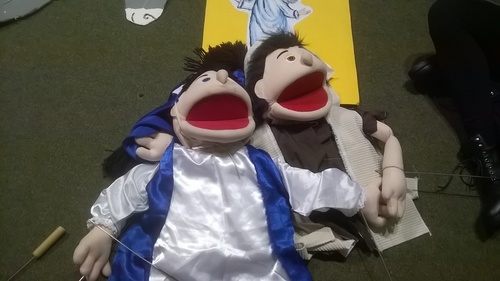 The ‘Angel Tree Project’ takes the place of the annual ‘Toy Service’ a Family Service that will be held on the 2nd December 10.30am, when The Puppets are due to reappear after some months break. On the evening of the 2nd December we have the annual visit to the Civic Theatre for the Pantomime (oh, no we don’t---Oh, YES we do). For those of us who are left behind, we are taking a trip to Chelmsford Cathedral in the evening where they are holding an Advent Procession starting at 6.00pm. If you would like to go, please have a word with Revd Carolyn as she is trying to organise lifts to the Cathedral… There will be NO Evening Prayer held in St Mary’s that evening… There are lots of things going on over the next couple of weeks, so please feel happy to join us as we work our way along to the Christmas Season. By-the-way: Rev’d Anne’s Bees have gone away on holiday, (to the Bahama’s I think) so there will be no more jars of honey until next summer.